Zebra crossings, made famous on the Abbey Road album by The Beatles, have come to signal the international symbol for giving pedestrians the right of way. Despite a painted on warning to drivers, various studies have shown that drivers typically don’t slow down for people who are walking across the street. 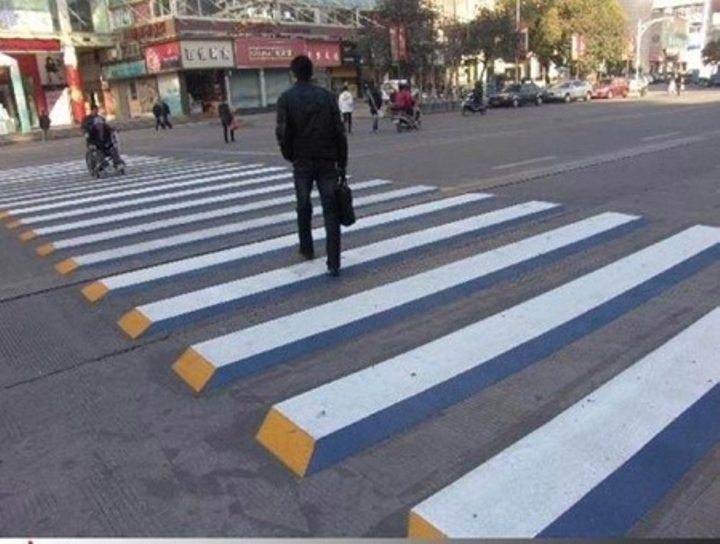 In Gujarat, India the pedestrian safety issue has become a big problem. That’s why a mother and daughter have teamed up to try and make the roads safer. Their solution? Draw optical illusions on the road that can trick drivers into slowing down. Here’s an example of their optical illusion. The artists say that the illusion forces drivers to slow down, but disappears at a close range to prevent panic breaking. The goal is to make the illusion just perceptible enough that it catches divers’ eyes, but not so much that it becomes distracting and causes new accidents. Architect’s Newspaper reports that the idea is being tried out in both China and India. At this time there is no quantifiable proof of how well they work compared to their flat counterparts. In any case, it’s a cool concept that might save lives, which makes it worth a try.